Pastor John Hagee: "In Defense of Israel"
This past weekend was undoubtedly the weekend of Pastor John Hagee and his wife Diana. They came to Israel with nearly 1,000 followers and supporters from all over the United States and other parts of the world to celebrate their "Salute to Israel" event which usually takes place in different parts of the US. This year, to mark Israel's 60th anniversary, they decided to do it in Jerusalem and other parts of Israel. Pastor Hagee's official program began on Friday morning at the Menachem Begin Heritage Center where the launch took place of the Hebrew edition of his book In Defense of Israel which was shared with the launch of the book of David Brog of Washington, DC, Standing With Israel both of which are published by Gefen Publishing. In opening the proceedings, Harry Hurwitz, Founder and President of the Menachem Begin Heritage Foundation, said that Pastor Hagee had been greatly impressed by Menachem Begin's love of Israel and Eretz Israel; his courageous and visionary leadership; his ceaseless struggle in Europe; as commander of the Irgun in Palestine; as leader of the Opposition in Israel and as Prime Minister. Hurwitz quoted from a document found in the archives of the Begin Center in which Evangelical Christ ians in the US declared that their Christian Zionist Congress of America founded by Pastor Hagee had become "a monument to that man's inspiration." They mourned with all of Israel when Begin passed away and shall never, never forget this Lover of Zion. The main speakers of the event were Ilan Greenfield, the publisher; Knesset Member Rabbi Benny Alon, who spoke of the unique role of Pastor Hagee and paid tribute to the Begin Center for hosting the event and Rabbi Shlomo Riskin, Chief Rabbi of Efrat who spoke of the history of the alliance between the Bible-believing Christians and the Jewish people which he said was one of the most important developments after close to 2,000 years of enmity, persecution and pogroms. Riskin called the rapprochement between the Jews and Christians "one of the miracl es of the 20th century." David Brog spoke of his collaboration with Pastor Hagee and the importance of that work which is of great political significance in the US. On Sunday evening, Pastor Hagee delivered an impassioned address in the main hall of the Binyanei HaUma saying that his organization has one goal—to support Israel. Likud leader Binyamin Netanyahu proclaimed that Israel has no better friends in the world than Christian Zionists. "This is a friendship of the heart, a friendship of common roots and a friendship of common civilization." At the end of the evening, Pastor Hagee presented monetary gifts to 16 worthy causes in Israel totaling $6 million, among them the educational institution at Migdal Or; education projects in Ariel; the Magen David Adom; the Menachem Begin Heritage Center; the former residents of Gush Katif and others. Immediately after Yom HaAtzmaut, on Friday 9 May, the International Board of the Menachem Begin Heritage Foundation will meet to receive an annual report of this living memorial project. Participants will include Israelis and people from abroad who are coming especially for the event or who will be here for the 60th Yom HaAtzmaut celebration. The opportunity will be taken to honor the first MENACHEM BEGIN FELLOWS who are now making special contribution to the Endowment/Development Fund. Among distinguished VIPs at the event will be Dr. Ze'ev Binyamin Begin, Prof. Moshe Arens, Knesset Member Ruby Rivlin and others. They were guided by Harry Hurwitz and Herzl Makov throughout the museum tour and said at the end that it had been a very unusual and impressive experience. The Begin Center group continued up to Kibbutz Gesher (Bridge) founded in 1939. It was also the site of a nearly miraculous power plant on the Jordan River begun by Pinchas Rutenberg which operated from 1933 to 1948 when it was destroyed by the Arab Legion. The members of the kibbutz also told a ver y moving story of the evacuation of the children of the kibbutz during the War of Independence in the middle of the night. 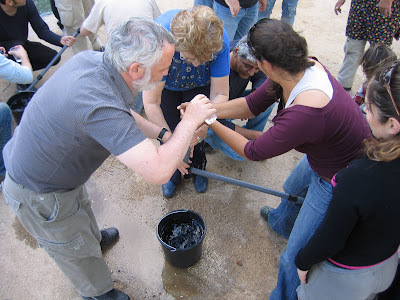 The Begin Center staff finished the day with team-building activities at Ein Muda, a beautiful spring near Kibbutz Sheluchot in the Beit She'an area and a gathering place for hundreds of storks and other bird life.